Most of the time I think of myself as a TOB (Tough Old Broad), but real life keeps proving me wrong. Much of the research for my Native American romance, Dancing on Coals, was disturbing, and the particulars of the scalp hunting industry were downright upsetting. Recently I had an idea for a story that would touch on buffalo hunting as background for one character. What I knew about the whole thing just off hand wasn’t particularly pleasant, and delving deeper didn’t change that but did give me some insight. For me, writing romances set in the Nineteenth Century West is always a balance between the love stories, which are a truth of the human condition in all times, and what we know was often a brutal and unromantic environment. Buffalo hunting was decidedly on the brutal side. As an organized profession buffalo hunting got off the ground in a big way as the railroads expanded. The railroads hired hunters to provide meat for their crews. After the Civil War, the industry took off as demand for buffalo robes rose all over the country. I remember my Canadian relatives in Ontario showing me an old buffalo robe when I was a girl. Other uses developed, such as making drive belts for machines out of the tough leather. Railroad workers were paid $35 a month (whites, not Chinese) at the time, so it’s easy to see the lure for a man to take up buffalo hunting when hides sold for $2 (1870) to $3 (late 70's) each and a good hunter could kill 250 animals a day (and needed at least two skinners working with him). 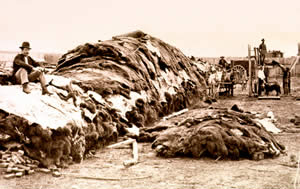 It was a year-round profession, and men would bring as many as 2,000 hides at a time to hide yards in places like Dodge City, Kansas, and Fort Worth, Texas. Reading about it doesn’t give me any urge to pin posthumous skill medals on those hunters. William F. (“Buffalo Bill”) Cody got his nickname for his large daily kills, but Wyatt Earp, Bat Masterson, Pat Garrett, and Wild Bill Hickok are all said to have earned a living hunting buffalo at one time or another. The nature of this herd animal is such that the hunter could set up a stand (put his Sharps .55 on a tripod in a fixed location), kill the leader of a group, and the others would mill in confusion instead of running away. The hides were taken and the meat left to rot where the bison fell, except for the tongue, which brought an extra 25 cents because it was considered a delicacy and popular in restaurants. A secondary industry of collecting bones and grinding them for fertilizer also grew out of the slaughter. The Government’s fine hand was in all this too, of course. Killing off the buffalo was promoted as a way to starve the Plains Tribes into submission (and it did), and therefore the extinction of the bison was officially encouraged and any preservation efforts discouraged. There were an estimated 50 million bison on the Plains before “civilization” arrived, and less than 2,000 alive in 1884 at the end of the buffalo hunting era. Today there are several buffalo ranches here in Colorado that I drive by on a regular basis, and the estimate I saw was that the descendants of those 2,000 survivors now number over 300,000 nationwide. Some small part of me wonders why no one decided to cultivate the bison that were already there in the good old days instead of flooding the Plains with cattle, but then I have a reality check and remember that the barbed wire fence that confines a cow doesn’t impress a buffalo. The fences around the buffalo ranches are impressive things that remind one of movies about gulags, only more formidable. I’ve heard that “cowboys” who herd buffalo carry shotguns as necessary tools, but never checked to see if that’s a tall tale or has some factual basis. One of the things that amazes me is how much I have to find out about certain subjects when in the end I'm only going to include a sentence or paragraph about it in a novel, but that seems to be the way it goes. P.S. The guy in the photo looks like he's wearing a bowler, doesn't he? But I think those are cowboy boots. 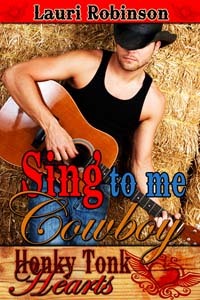 My contemporary western romance with a touch of suspense, BE MY GUEST, is set in and near Post, Texas. Please let me tell you a bit about this fascinating West Texas town. In the early 1890s, Charles William Post developed a popular caffeine-free coffee substitute called Postum and later made a fortune on breakfast cereals such as Grape Nuts and Post Toasties. As Post's wealth grew, his interests began to expand into other areas. One project that had always intrigued him was the creation of a planned community of model homes and industry. His success in the prepared foods industry provided the financial resources to make this dream a reality. C.W. 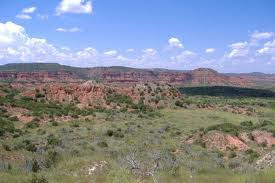 Post initially chose a site on the high plains of the Llano Estacado for his projected settlement. 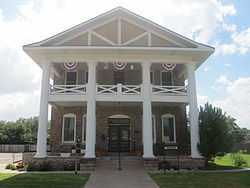 Construction of Post City began at the original site until surveyors discovered that the town was 11 miles from the geographical center of Garza County. 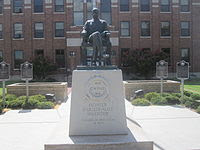 Texas State law required a county seat to be located no more than 5 miles from the center of a county, and thus the chosen site could not serve as county seat. Post ordered work to stop and he shifted resources to a site located nearer the center of the county. The new site is the present-day location of Post, Texas. 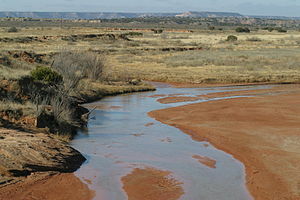 Post is located at the edge of the Caprock escarpment of the Llano Estacado, the southeastern edge of the Great Plains. 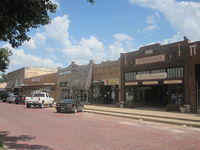 Post is at the junction of U.S. highways 84 and 380, east of the Caprock escarpment near the west central part of Garza County. He purchased 200,000 acres of ranchland and established the Double U. Company to manage the town's construction. The company built trim houses and numerous structures, which included the Algerita Hotel, a gin, and a textile plant. They planted trees along every street and prohibited alcoholic beverages and brothels. The Double U. Company rented and sold farms and houses to settlers. A post office began in a tent during the year of Post City's founding. Two years later the town had a school, a bank, and a newspaper, the Post City Post. The railroad reached the town in 1910. The town changed its name to Post when it incorporated in 1914, the year of C. W. Post's death. By then Post had a population of 1,000, ten retail businesses, a dentist, a doctor, a sanitarium, and Baptist, Methodist, and Presbyterian churches. In case you’re yawning and thinking who cares, I hope you will stay with me. I have long been fascinated that C. W. Post founded this town. My husband and I have driven through Post what seems like a million times in trips to and from Lubbock to visit relatives. I decided it was the perfect setting for BE MY GUEST. Aurora scooted to the right as far as possible. "Hey, who do cyou think you are? This is my booth, and no one invited you to share it with me!" The working title for Under A Texas Star was El Paso Trail. My son still prefers the old name, but you can’t argue that the new name isn’t sexier. 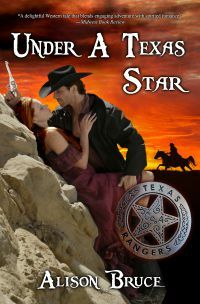 Marly Landers and Ranger Jase Strachan are both headed for El Paso when they meet. Marly is after the man who cheated the people of her home town of Cherryville, Kansas. Jase is after a con man who cheated the wrong people in his home state of Texas. Of course, their quarries are one and the same man. The destination isn’t nearly important as how they get there, but they do get to El Paso eventually and I had to get a mental picture of the town before I wrote about it. In 1581 Spanish conquistadores found their way across the Rio Bravo del Norte (aka the Rio Grande) from what would become Estados Únidos Mexicanos into what is now the United States of America. 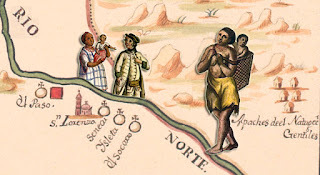 They named the passage El Paso del Rio del Norte (the pass through the river of the north). Of course, the Europeans were “discovering” an area that had already been home to native cultures. Archeological evidence supports thousands of years of human settlement within the El Paso region. The first European settlement that would be called El Paso was south of the river – present day Ciudad Juárez. Apaches discouraged European invasion north of the river for as long as they could, but eventually farms and missions migrated north. In 1682, the Tigua Indians, fleeing the Pueblo Revolt in New Mexico, together with their Spanish masters, built the mission Nuestra Señora del Carmen, in what is now a suburb of El Paso. In Under A Texas Star, Marly skips town and goes to a village surrounded by farms and vineyards that had, up to the year before, been Tigua land. In 1874, the State of Texas passed a law that turned over 500 parcels of Tigua-owned land to American settlers. One of the key aspects for my book is that El Paso served as a major stop for the famous Butterfield Overland Mail Coach. That, and its easy access to Mexico via the Camino Real, made it an ideal destination for Charlie Meese, the fugitive Marly and Jase are tracking. At the time the story takes place, El Paso has only just been incorporated as a city. Jase notes that it has grown a lot since he was last there. To get a sense of that for myself, I looked up old maps of El Paso so I'd know where my fictional landmarks would fit among the historical ones - or at least which way was what. After breakfast, Jase arranged for them to have baths at one of the more reasonably priced hotels. Jase took the privilege of having the first bath, giving her the chore of taking their trail clothes to the Chinese laundry. Since he trusted her to go out on her own, Marly deduced that El Paso wasn't as dangerous as she thought―at least not by daylight. It might as well have been a foreign country. El Paso was nothing like anywhere Marly had been before. There were at least as many people speaking Spanish as English, and a fair number speaking other languages like German, French and Chinese. The railway was coming and the city was already showing signs of things to come. The El Hombre was just off the Camino Real that had linked Santa Fe and Mexico City since the first Spanish colonists settled in the area. Just down the street and across the river lay Mexico. Marly put a visit to the border on her to-do list, along with finding the post office, dealing with Meese and settling her account with Jase. However, first she had to find the laundry. Some day I’ll have to take Marly and Jase back there when the railway comes through. That’s when El Paso really exploded - in population and lawlessness. 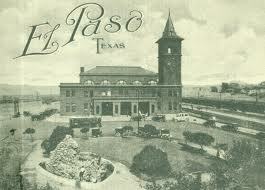 In fact, that’s the El Paso I was originally headed to until research set me right. Ah well, it gives me something to play with later. I couldn’t find a definite answer as to when the ‘Cowboy’ hat was given its name. Hats with tall crowns, which provide insulation, and wide brims, which provide shade, have been worn for centuries, and the “Stetson” design has changed very little since the first hat hit the market in 1865 by J.B. Stetson. Actually the bowler hat was the one commonly wore in the early days of the west, and had been proclaimed as the ‘hat that won the west’ before the Stetson—or Cowboy hat. 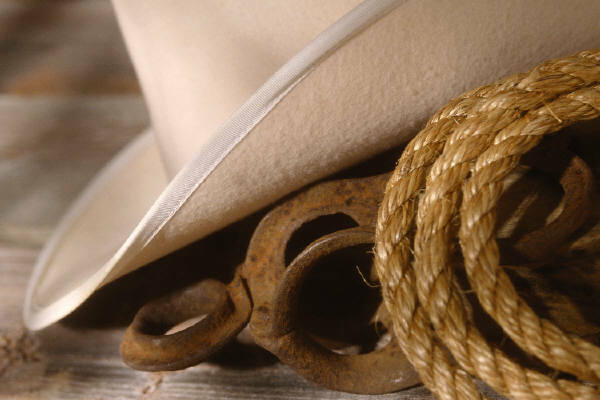 John Batterson Stetson manufactured a hat in 1865 that he marketed to the ‘cowboy’ as the ‘Boss of the Plains’. These hats were light weight and water-proof and depending on the construction, cost anywhere from five to thirty-dollars—the expensive ones being made of pure beaver felt. J.B. also carried the ‘charisma’ and ‘charm’ of the west back east by retelling tales of his hats, and soon the ‘Boss of the Plains’ was as popular with city dwellers as it was cowboys. The Stetson received even more acclaim when one was discovered amongst the sunken wreckage of the USS Maine in 1912. Once cleaned, the hat that had been submerged in seawater for over 14 years was relatively undamaged. So, with all that said, what’s in a cowboy hat? Well, inside most original Stetsons (and many since then) was/is a memorial bow to past ‘hatters’. On the back of the hat band inside the rim there is a symbol that appears to look somewhat like a Skull and Crossbones. In the early days felt was treated with a form of mercury that was highly toxic. After several years of making hats, early hat makers were known to come down with uncontrollable and often violent twitches. A result of the mercury their bodies had absorbed. Hence the term ‘Mad Hatters’ or ‘Mad as a Hatter’. My brother-in-law, a cowboy his entire life, bought my youngest son a Cowboy hat years ago for his birthday. About ten at the time, my son was so enthralled with the hat, he plunked it on his head without allowing my brother-in-law to ‘shape’ it. 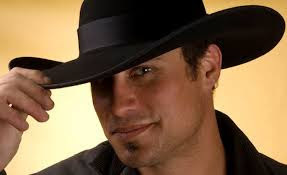 Therefore, my brother-in-law teasingly referred to it as a George Strait-out-of-the-box hat. The shiver that zipped up her spine caught in her throat with the power to strangle the life out of her. 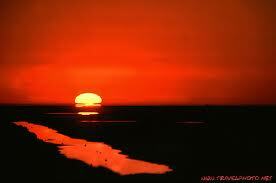 There are certain voices one never forgets—and a first love ranked very near number one. Heather fought for air. It couldn’t possibly be him. He was in Nashville, where all the famous singers hung out. Her hands trembled as air finally entered her lungs. Could this night get any worse? Could her life get any worse? Pushing off her knees, she straightened her spine, and wasn’t surprised the strangling sensation came back full force. Her heart—as if it wasn’t already racing—shifted into overdrive. Lance Dugan. From his George Strait-out-of-the-box-hat to his un-scuffed Justin boots. The last person she’d ever expected to see. The last person she’d want to see in the shape she was right now. Inhaling until her lungs threatened to burst, she squared her shoulders and wished she was back in her car, sweating to death, being eaten by wild beasts, anything but standing face to face with him. 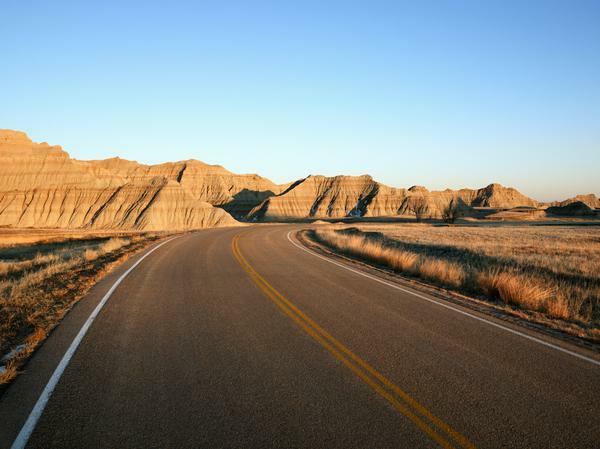 You haven’t truly seen “the west” until you’ve seen the Badlands. Why do I say this? I am no expert, but to me, this area had a surreal quality about it. A weather-beaten aged beauty. Lots of dust, and those varying shades of rust, brown, gold I’d always envisioned “the west” to be. I could picture horse herds here more than anywhere else, and bands of Indians (er, Native Americans) roaming the prairie. On a drawn-out trip out west to visit family in Montana in 2002, my husband, daughter and I decided to hit a few landmarks along the way in South Dakota, plus Yellowstone. The Corn Palace was one, since I’d run across that oddity (to us) on some type of “Don’t Miss” travel tips. Wall Drugs was another, of course, due to all the signs we’d seen. Mount Rushmore, of course—and I was stunned that we could glimpse part of the massive stone heads from the highway. That was a majestic sight. 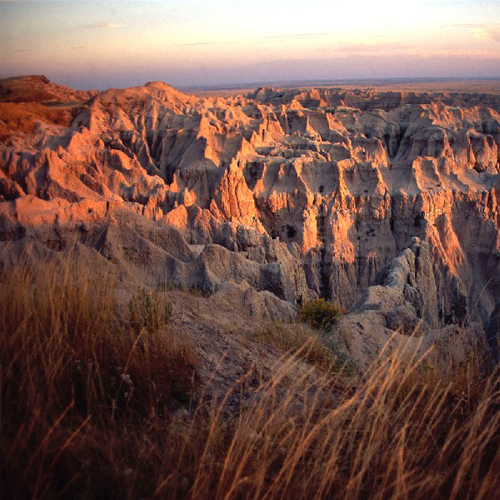 But we all loved seeing the Badlands. And I mean big time “l-o-v-e-d” as in “we HAVE to stop here on the way home again” love. Why? We couldn’t explain that. Sure, they have a ‘rugged beauty’ and ‘striking geologic deposits’ according to the National Park website. It’s nice to know that ‘ancient mammals such as the rhino, horse and saber-toothed cat once roamed here.’ Yes, it’s astonishing that it covers almost a quarter of a million acres, that it includes mixed-grass prairie. And that ‘bison, bighorn sheep, prairie dogs and black-footed ferrets live there today.’ Great. 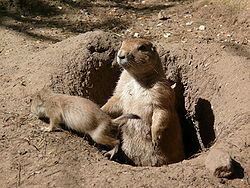 I don’t know about the other animals, but we saw prairie dogs. Hundreds of ’em. I could have watched them pop in and out of their holes for hours. Cute little buggers. First of all, a disclaimer. I live in a state known for its “leafies” – oak, maple, elm, birch, ash, pine plus plenty more, and that’s just in my neighborhood. Michigan is known for its forests and Great Lakes, plus all the small lakes in the Mitten and the UP. Green and blue are the primary colors (and I’m not talking green and white for Michigan State or blue and maize for UM). The prairie, as I first caught sight of it when we crossed from Minnesota farmland into South Dakota farmland, was fairly green, mostly brown. Wide open spaces, as the song goes, cottonwoods (I think) that usually grew near creeks or rivers. You could see rain clouds in the distance and never get wet. Very odd to us. Even the trees looked different. So at first we didn’t notice a whole lot, driving the expressway – being from Michigan, a car ride can be pretty much "same old, same old" boring. Then we turned off to where we’d scoped out Google maps ahead of time. No trees here. Like none. Just a few scattered houses in dry, brown land. I have to say it was the middle of a hot summer, too. Anything above 85 is hot to us. It must have been 90+. And don’t tell me it’s a dry heat. Hot is hot. We drove down a two-lane country road and suddenly the world dropped off. That’s the Badlands to me. We stopped the car, although the road curved along the rim’s edge – maybe for a ways, we didn’t know. Or care. We all piled out. Stood on that rim, my husband and daughter closer than I ever could get to the edge. And just stared. Awestruck. The rock formations, the little gullies, the striations in the soil and the way the sunlight hit them just right, giving the browns, gold and rust hues a tinge of purple, blue, rose, even a faint gray brown. It was marvelous. No photograph can do it justice. I can’t even describe it here all that well. But my imagination lit up, and whether or not any cowboys drove their cattle along the rim or the Indians meandered around the gullies at the bottom, I had a sense of the true magic of “the west.” Yes, the Rockies are just as magnificent. I’m sure there are other canyons that are just as wonderful. I guess it struck me so hard because this was my first visit past the Mississippi River. I’m still a greenhorn. I haven’t seen Wyoming’s Wind River range, or Colorado’s Pike's Peak, or Utah’s Green River area, or Nevada’s desert, or even Idaho and Arizona. We saw plenty of cowboy gear at Wall Drugs. Hats, boots, scarves, chaps, belts, weapons and spurs, you name it. There was no fence along the rim. A sign here and there, maybe, warning of a sheer drop off and the danger in trying to climb down. On our drive back home from Montana, we chose a spot where we could drive through a larger area (off 240, or whatever they call the roads there) and that was even better. Again, hard to explain the scenery. We parked and walked along part of the gully bottom, saw the interesting types of “greenery” – not sure if they were grasses, or cacti, or some type of heather or what have you – and my husband and daughter climbed to a rocky hill (I’m too chicken and dislike heights) so I could take photos. Alas, I haven’t scanned those in yet to my computer. But we sure enjoyed our visit out west. To me, the Badlands epitomize what “the wilder west” might have looked like when I thought of “the Hole in the Wall” and other remote spots for black-hat bad guys to hide. 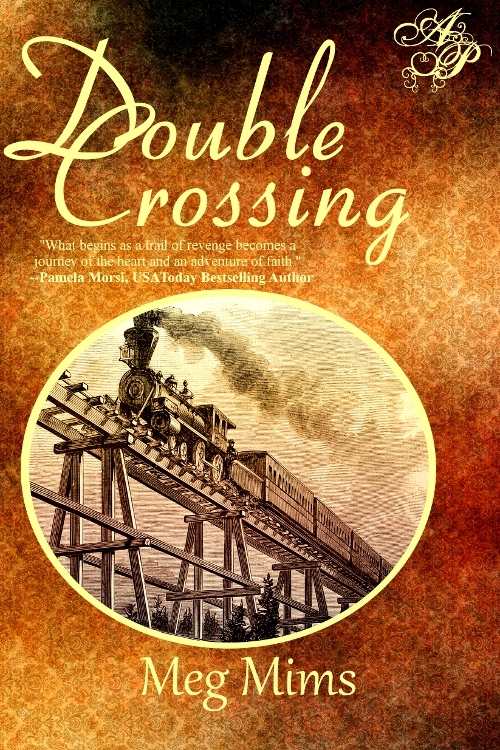 The Badlands do not figure in my book, Double Crossing, which is set for the most part on the transcontinental railroad from Omaha, Nebraska to Sacramento, California. But it did win the 2012 Spur Award for Best First Novel! That's a great honor. Check out the 5-star reviews on Amazon and Goodreads! Want to connect with Meg? Check out these links. 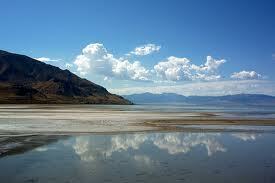 Part of my first book, Darlin’ Druid, is set in Utah, c. 1872. This required a lot of research, especially because I’ve never been able to visit the Beehive State in person. Today I’d like to share a smidgen of what I learned from books, internet sites and the Utah State Historical Society. When Brigham Young first looked upon the Salt Lake Valley in 1847, he is supposed to have said “This is the place.” It’s hard to imagine why he chose such a dry, inhospitable spot for his people to settle, but history has proven him right. Within a few decades, the Mormons turned that dry valley into fruitful farm land and Salt Lake City into a thriving community. The early pioneers had few material resources. Thus, they had to rely on their own ingenuity and hard work – their industry – to survive. Think of a colony of bees working together, building a new hive, and you’ll know why the beehive became the emblem for the provisional State of Deseret in 1848. 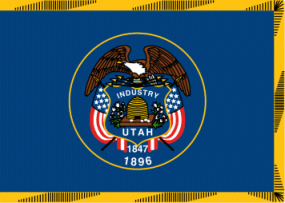 The symbol was retained along with the word "industry" on the state seal and flag after Utah was granted statehood in 1896. “Deseret” is reportedly a word for honey bee in the Book of Mormon. The honey bee was named official state insect in 1983, thanks to the lobbying efforts of a fifth grade class. From those snowy gorges, the Mormons drew life-giving water via a clever irrigation system, allowing them to turn the desert valley into rich farm land. 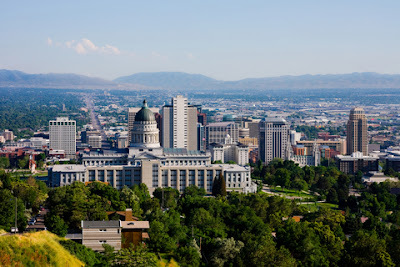 They brought water to Salt Lake City in the same way, laying out irrigation channels along the streets, which naturalist John Muir describes this way: "The streets are remarkably wide and the buildings low, making them appear yet wider than they really are. Trees are planted along the sidewalks -- elms, poplars, maples, and a few catalpus and hawthorn . . . ." Muir goes on to complain about the irregular size of trees and buildings, and disapproved the Latter Day Saints' stand on polygamy. Yet, from his description, it's plain to see the Saints planned their city with an eye for beauty as well as practicality. The following is an excerpt from Darlin’ Druid in which my heroine, Jessie, marvels at her surroundings while out for a Sunday afternoon stroll. A short while later, she paused beneath a leafy elm tree and fished a handkerchief from her reticule. As she had many times before, she blessed the city’s Mormon founders for planting so many trees along the broad streets. Their shade was a godsend in this heat. Patting the dew from her forehead and upper lip, she smiled at a group of youngsters frolicking in a small peach orchard across the street. The city abounded with fruit trees – apple, plum, but most of all peach – and a variety of grapevines. Most every gray adobe or white clapboard house also displayed a vegetable plot and flower garden. All thanks to the Mormons’ ingenious irrigation system, a necessity in this hot, dry valley. There were even lilac bushes. Although long since done blooming for the year, they still reminded Jessie of home. Her mother had loved lilacs, and she’d planted several bushes around their cottage. Every spring their radiant purple blooms had filled the air with a heavenly scent – before the fire had swept them away along with the house and everything else, leaving only destruction behind. And nightmares. First South, 1872, with Salt Lake Theatre on the left. Built in 1861, the theatre staged plays, hosted dances and concerts. Brigham Young often attended. One guest said, "At the time of its erection, it was not surpassed in magnitude, completeness and equipment by any other existing house." Each event opened with prayer; no smoking or drinking allowed. *Notice trees lining the street. Temple Square, 1882, showing left to right, partially completed Temple, Assembly Hall, and the Tabernacle. One of the city's largest hotels was the Salt Lake House, where Jessie dines with an admirer. Run by a Mr. Townsend, a Mormon convert from Maine, the hotel stood on Main Street. Notice the stagecoach out front. Businesses and wagons loaded with goods. By 1870, a number of gentile (non-Mormon) businesses were in operation. Most Mormon merchants belonged to Zion's Co-operatice Mercantile Institution (Z.C.M.I.) and displayed the sign of the all-seeing eye. Next month I will dig into mining and railroading in Utah. Hint: Nevada and Colorado weren’t the only western states to experience silver booms. Last month on Cowboy Kisses, we discussed things we'd miss if we lived in the Old West. A week later, one of my molars broke off below the gumline and abscessed. Boy-howdy, did it ever hurt! But not to worry, I made an appointment with my favorite dentist and four hours later, I felt better than I had in a week. For us, this is not uncommon and we take dentistry for granted. Yes, most of us aren't exactly thrilled with dental appointments, but we're not writhing in agony for months on end, either. Not too many years ago, the infection in my molar could have killed me, and many did die of conditions caused by dental issues. Anyone who has had a severe toothache knows how happy you can be to see your friendly local dentist. Granted, my dentist is top-drawer, but dentistry in general is such an improvement over the available technology in the Old West that anyone, anywhere today can be relieved of pain. I know very little about the history of dentistry, so I asked my aforesaid favorite dentist to write an article about it. Here it is, a short overview of the history of dentistry. Be happy you live in 2012! Dental treatments have been done for as long as toothaches occurred. They ranged from prayer or incantation, advancing to many dubious treatments such as bleedings, leeches or acupuncture. There were a plethora materials packed into the tooth to stop tooth aches such as wood, ivory, gold leaf, bees wax, gum and arsenic, to name just a few. ﻿Arsenic was used in the first root canal treatment in 1930s of course it is not known if it killed or cured. 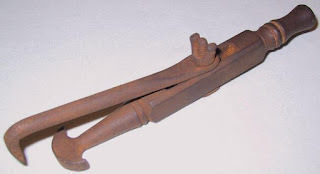 The most common procedure was the extraction of the tooth with a primitive instrument from the 14th Century, made by a blacksmith, called a Pelican (much like a pick or lever) to dig the tooth out, most likely leaving much of the tooth or breaking the jaw or causing other numerous jaw problems. The extraction forceps weren’t developed until the 1800s. Anesthetics came around with the discovery of laughing gas (nitrous oxide), ether, and chloroform that were used in dentistry in the mid-1800s. 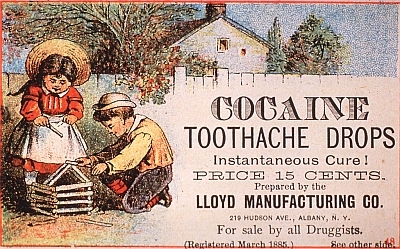 Cocaine was used in the late 1800s as an anesthetic, later Novocain was developed in the 1900s because it wasn’t so addictive. One of the most famous dentists of the Old West was John Henry “Doc” Holliday, who graduated in Philadelphia 1872. He practiced only a couple of years when he was diagnosed with “consumption” or tuberculosis and given only a couple of years to live. He went out west to extend his life in a drier climate and found gambling to be much more lucrative than dentistry, although it was known that he did on occasion practice dentistry. All of the modern niceties of dentistry were found mainly east of the Mississippi but not in the Wild Frontiers. It was only when cities became large; such as San Francisco and destination cities on the main routes of intercontinental travel, that dental services became more available. The Wild West did not have most of the niceties and had to revert to the more primitive forms of treatment, since there were no drugs, tools or dentists. Can you imagine the use of gun powder to cauterize a toothache; or trying to remove a tooth with anything available? Many people died from abscess or dental treatment, as they did in the early days of history. It must be remembered that the high speed air driven drills, sharp one-use needles, good dental materials known today, weren’t being used consistently until the 1950s. People born in these later years can still remember the old belt-driven electric motors and big bore dull needles that were used over and over. Anesthetics are not always used in many of the Third World nations to this day, unless you have the finances to have such luxuries. Jacquie Rogers again: I'm glad to live in an age where we can be free of chronic dental pain. Of course, western historical romance novels rarely address dental problems, or eczema, or athlete's foot, or other such maladies that have plagued humans since the dawn of history, but it's still good to understand what people endured on a daily basis. Even so, wouldn't it be grand to spend a week or two in the Old West? Maybe experience a stagecoach ride through Wyoming's Wind River Canyon, a high-stakes poker game in San Francisco, a night in a bawdy house (ahem, just to see who's there), a visit to a mining boomtown, or a day or two on a cattle drive. But please, not with a toothache!